Skoda rapid facelift is expected to launch this festive season in India. Ahead of its launch two test mules have been spotted near the company’s Chakan plant in Pune. 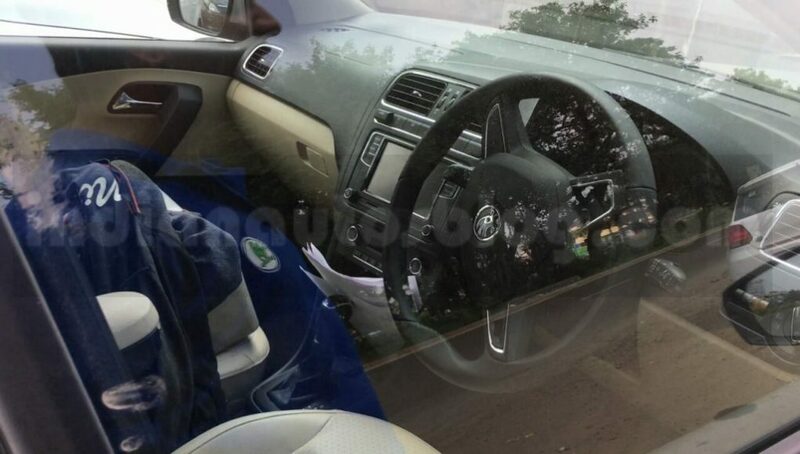 Also, the interior of the car has been leaked in the spyshots, giving us a prominent view, and the top end variant features a new touchscreen infotainment system. 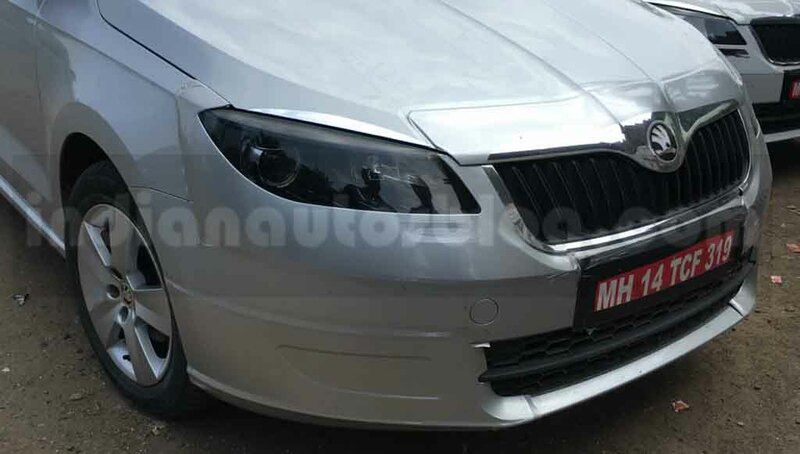 Upcoming Skoda Rapid facelift sports a redesigned front grille, and headlights have been revised as well. They come much sharper compared to the outgoing model, and also bear similarity with the European model. The spyshots of the test mules captured the top end variant of upcoming Rapid facelift, and it sports projector headlamps with smoke effect. A lower variant has been spied as well, which features halogen headlamps. The interior of upcoming Skoda rapid facelift hasn’t been changed much compared to outgoing model. But a MirrorLink touchscreen infotainment system with Bluetooth, reverse camera display has made its way into the top end variant, which enhances premium appeal. Apart from that, the Rapid facelift also dons features like new upholstery, rain sensing wipers, cruise control, electrically adjustable ORVMs. 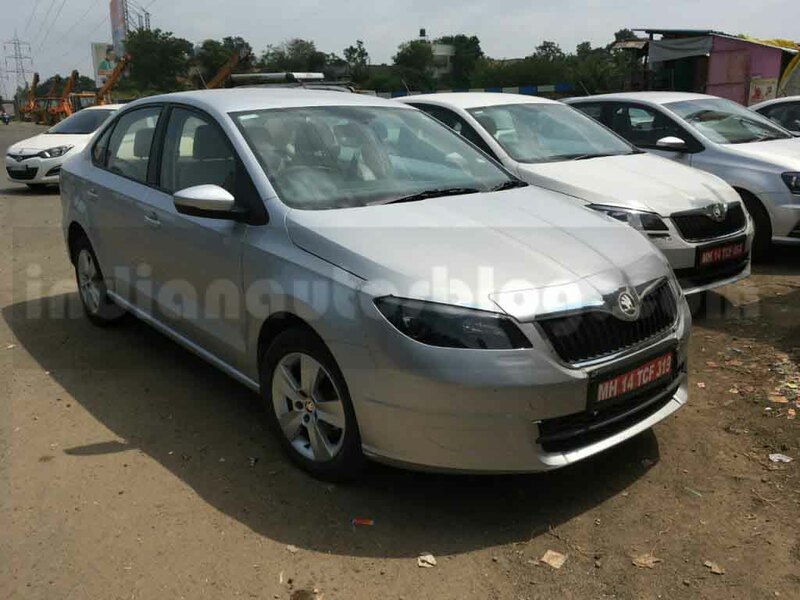 Power source for Skoda rapid facelift has been updated as well. The 1.5-litre TDI diesel engine has been updated to produce extra power. Instead of 105 PS in the outgoing model, it kicks out 110 PS at 4,400 rpm in the facelift model, while torque amount of the car remains unchanged at 250 Nm in between 1,500 rpm and 2,500 rpm, with a fuel economy of 23 kmpl. On the other hand, the petrol engine comes untouched, as it continues to churn out 104 PS of peak power at 5,250 rpm and 153 Nm of peak torque at 3,800 rpm, and it delivers fuel economy of 14.3 kmpl. Transmission options include a 5-speed manual gearbox and a 7-speed DSG automatic unit as well.